The outflow tract contains a proximal ('Conus') region, which evolves from the anterior heart field and a distal ('Truncus') region, which arises from the secondary heart field both. Both regions covered by myocardium are divided by the aorticopulmonary septum (APS), which originates between the fourth (systemic) and the sixth (pulmonary) aortic arch arteries in the aortic sac, and constitutes the base of the aorta and pulmonary trunk. Septation proceeds into the truncus and continues on into the conus. The aortic and pulmonary semilunar valves form in either side of the divided truncus. 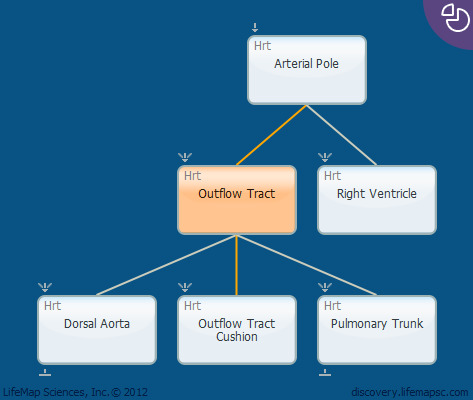 As the secondary heart field-derived myocardium is added to the outflow tract, the outflow tract lengthens. This elongation is necessary for outflow tract rotation, required for correct alignment of the pulmonary and aortic arterial trunks with their respective ventricles. The outflow tract will form the conus and truncus arteriosus.